Matchbook has a very unique project where they publish stories as Google Ads. Mine is about Velella, or By-the-Wind Sailors. They’ve always fascinated me, not least because they look like blue upside-down hearts. Read Velella, Velella and the entire Volume 4 of Ad Stories here. I have a new micro prose piece up at New South Journal today. Another retelling of the always retellable Alice in Wonderland. Before she went to space, Alice Ate Mushrooms. She collected asteroids from the belt, saved stars, spilled milk, spun dust, fished for stars, and jumped into tea. A happy belated New Year’s. It’s the Year of the Monkey! Here is an amazing video of some very zen snow monkeys. My watercolor, “Curious Child,” is included in Issue 34 of the Berkeley Fiction Review. The issue’s cover art is by Donna Choi. I also had two Twitter fiction publications in January and February: Barnacle Hug in Cuento and Honeycomb Maze in 7×20. Read them @7×20. One new story and four old stories retelling Beanstalk Jack, Little Red, Long-Haired Rapunzel, and Sleeping Beauty. Read it here or @onefortyfiction. A special koala and lovely Mother’s Day to all. Read @7×20. This was originally a winner in Phoebe Journal’s First Ever Twitter Contest. 140 and Counting is available now on Amazon for Kindle. 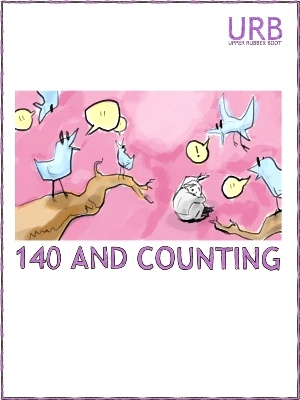 It’s an anthology of exactly 141 stories and poems compiled from Twitter magazine 7×20. One of mine (actually, my first ever published Twitter story) is included in the “jurassic sushi,” aka science fiction and fantasy, section. Editor Joanne Merriam on Twitter fiction: “it shoehorns a little literature into people’s days, between celebrity updates and friends’ witticisms, creating a small opportunity for reflection that might otherwise have been lost.” It’s a way to shoehorn a little writing into your life, also, and fun to boot. Read it here or @nanoism. This little story was inspired by my love affair with French press coffee last year, especially from this little Chapel Hill café. Read it here or @nanoism. Like optimist friends who stay optimist, even after missing the ark.